Two-thirds of the keel of Ceiba shown alongside the foundation where she will be built. All foundation posts and keel blocks are complete and in place. Photo July 30, 2018. Ceiba is taking shape at our eco-shipyard in Costa Rica. A reforestation project is underway to ensure that enough trees are planted on a regular basis to replace the materials used, off-setting the carbon footprint of the project and developing a sustainable system where more working boats of this kind can be built entirely of lumber planted for this purpose. Ceiba's keel is of storm-fallen mountain tamarind (Tamarindo del Monte in Spanish), uprooted by a hurricane in Upala. In addition to the core team, mentioned in the About section, many experienced individuals are contributing to the build of Ceiba. Naval architect Pepijn van Schaik of De Villiers - Van Schaik Marine Design is the technical designer of Ceiba. His past work includes Tres Hombres, Europa, and Ópal. Our electric engine is the work of Sigma Plus Associates. Veterans of the Ópal project, Sigma + is a leader in their field and we are proud to have them working on Ceiba. Based in Switzerland, the head engineer at Sigma Plus is Peter Heiss. Topsail Rigging Limited will be providing the entire rigging for Ceiba, with additional advisory support of Sailmaster B.V. of the Netherlands, who offers decades of knowledge and valuable advice, having worked on some of the world's largest sailing vessel constructions. It will take not only shipwrights, blacksmiths, riggers, electricians, welders and sailmakers to complete her-- but also a strong sense of community and commitment. By the time the 3.5 year building period comes to a close, it is estimated that nearly 250 people will have worked on the ship. We have chosen Costa Rica as our home port because of its commitment to carbon neutrality by 2021, and its favorable geographic position and business environment. For our shipyard land, we have secured a 5 year lease (with option to buy). 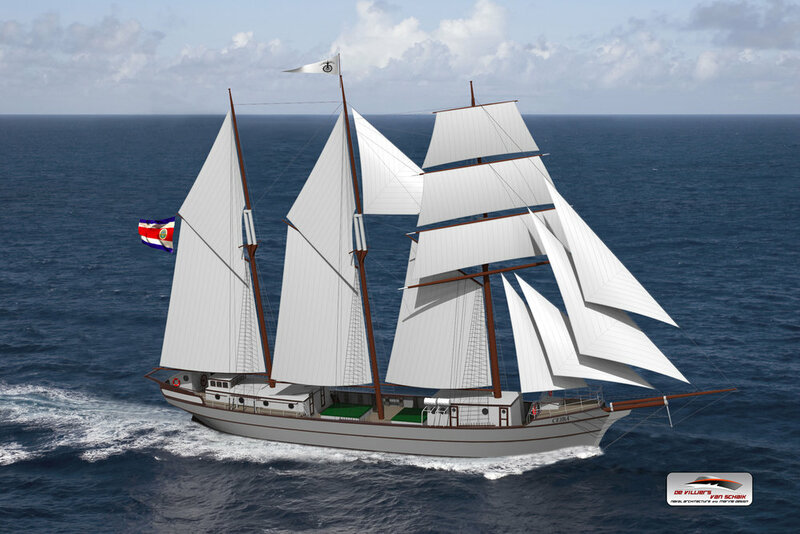 With classic lines and applied knowledge from the culmination of 5,000+ years of evolution in the art of sail, Ceiba's sleek design is paired with modern propulsion engineering and long-lasting build materials to make her the base of an efficient, prosperous & completely sustainable shipping model. 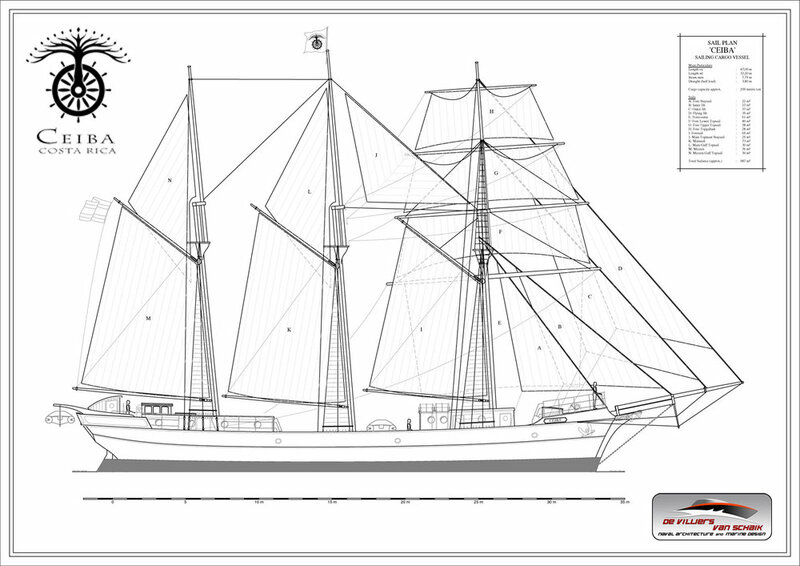 Her three masts will provide sufficient sail area to sail in very light winds, but also to provide flexibility and maneuverability for sail changes during heavy weather. Having sail area lower to the deck helps to stabilize the vessel, making her safer. Her three-masts also allow for flexibility when loading or discharging cargo, as her spars double as cranes. 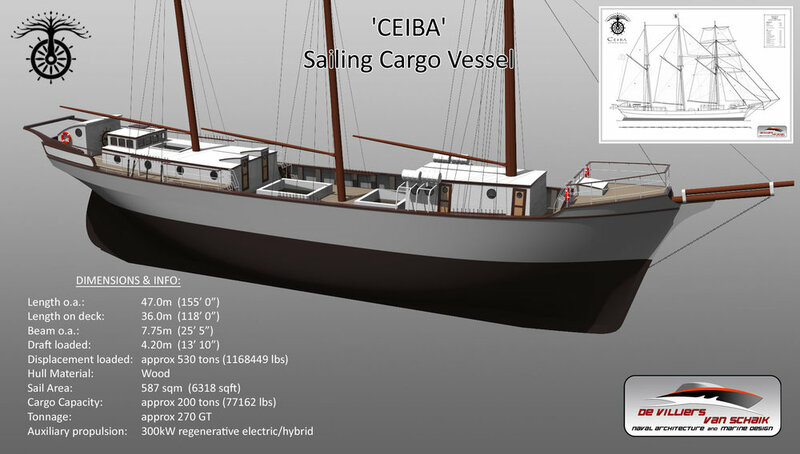 Ceiba will have a 100% electric engine. The electric engine will be coupled with the most modern solar batteries, panels and wind turbines to make all auxiliary power 100% renewably sourced. An advanced variable pitch propeller will convert kinetic energy into stored electrical energy to power the ship's functions. Due to the high torque efficiency of electric engines, Ceiba's engine will only need to be about 120 horsepower, which is easy half of what would be required for other engine designs. Ceiba will be built with locally sourced Costa Rican materials wherever possible. This project will draw upon local and international professional workers & volunteers, with a strong emphasis on building and maintaining strong relationships with the surrounding community. The build will take three to four years start to finish. 246 imperial tons / 12,360 cubic ft.